David Mandelbaum and Jessica Lloyd were completely exhausted. They had a happy marriage and successful careers in New York City, but the long hours they logged in the entertainment and finance industries, respectively, left them with very little energy. So, like any burned out, overworked professionals, they turned to coffee. But instead of getting the boost they needed from their morning cup, Dave’s stomach was consistently upset and Jess would get the jitters and eventually crash. 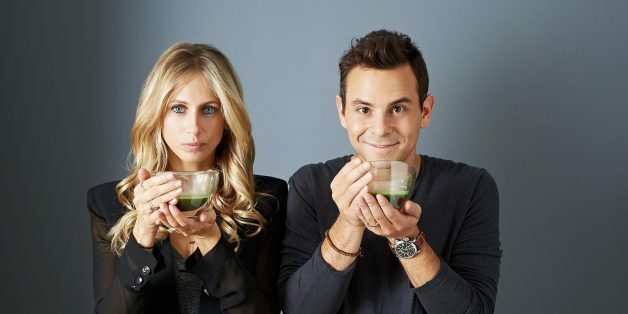 The couple went in search of an alternative, and in 2012 they discovered matcha -- a fine-ground green tea. A cup of matcha contains 34 mg of caffeine, which is the equivalent to one-third of a cup of coffee, or half a shot of espresso. “We turned to each other one morning and said, ‘why don’t people know about this?’” Jess told The Huffington Post. So the couple launched PANATEA. “It’s derived from the word ‘panacea,’ because it’s the tea that cures all,” Jess said. Although they were excited about spreading the word about matcha tea, Jess and Dave were both still working their full-time jobs and found themselves more overwhelmed than ever. While Jess made the decision to leave her job pretty quickly, it took Dave a little longer. Jess and Dave met in college and found they were great at studying together, laying the foundation for their future business partnership. PANATEA (pronounced pan-uh-TEE-uh) officially launched in February of 2014, and Dave and Jess, who are both 29 and have been together for 11 years, are set to launch a subscription program soon. Various coffee shops in New York have taken PANATEA on and are using the matcha powder in creative ways. “The wholesale accounts are pretty creative with how they use the product. Feel Food has a jalapeno matcha shot, Ground Support Cafe has an Arnold Palmer and The Butcher's Daughter has an iced matcha latte,” Dave said. These days, Jess spends her time managing day-to-day tasks of the business, like taking short inventories, making sure orders are filled and marketing their product. Dave is the big picture guy. “I’m thinking about where we're going in the next 6-12 months, while Jess is thinking, ‘what are we doing today that’s going to move the business forward?’ It’s a pretty yin and yang relationship,” Dave explained. Their lives are certainly different than they were a year ago, but the couple couldn't be happier with their decision. Check out the PANATEA website here. If you or someone you know is taking steps to live a life that's simpler, saner and more fulfilling, we want to hear about it. To submit a Letting Go nomination, email thirdmetric@huffingtonpost.com.